Last night, I had the immense pleasure of full immersion into the merry old land of Oz the way it’s never been seen before. Revealed by the vision of the great and powerful Sam Raimi and his master tinkers, from opening curtains it was clear that this was going to be a dazzling display that succeeds in recapturing the magic of the moment original audiences must have felt when first watching The Wizard of Oz in 1939. Nothing beats the fun and anticipation of a wll crafted title sequence to get you started on your journey, especially when your companion on that journey is Danny Elfman, who has and still does do some of his very best work with Raimi (Darkman, A Simple Plan, Spiderman). The score is immediately recognizable to any Elfman fan as classic Danny in his prime. Ad to that the stunning black and white photography and you are locked in for the ride. Oz the Great and Powerful is every inch made for a Real 3D experience and delivers the most colossal spectacular any team of Hollywood magicians can offer. It’s no wonder that the ever-changing scenery and many elaborate sets are to be drunken in slowly as the epic adventure of a carnival con man drags him the yellow brick road toward possible redemption. Aside from the stunning spectacle of magnificent scenery and Sam Raimi’s keen vision and incomparable sense of balance between fresh innovation and familiarity with the classic, the big seller for this film is James francos impeccable depiction of Oz. Franco does for the character what RDJ does for Tony Stark and what Johnny Depp did for Jack Sparrow in the first Pirates of the Caribbean; only he handles the character with such finesse and discipline that he creates a more three-dimensional character than anyone is likely to have seen on the silver screen. The complexity of the man has so obviously been thoroughly explored by Raimi and Franco that he becomes such a flesh and blood human it seems astounding that he could ever be a wizard. Franco’s depiction of Oz is such that he ceases, as an actor, to be a medium to the character, and fully becomes him in a way that every look and every utterance comes from the heart and soul of Oz himself. The amazing story of the redemption of Oz (both the land and the man) starts out in Kansas, where we find our trickster little more than a petty thief with some theatrical flair and a weakness for the ladies. The black and white photography is some of the crispest most beautiful I have ever seen and Raimi’s first action sequence of the film is harrowing, desperate, comical and brilliant, as is the predictable, but no less illuminating first glorious glimpse of the land of Oz in full color, mirroring of course the moment of Dorothy’s arrival 73 years ago. As a stranger in a strange land, Oz struggles with the opportunity to start fresh and the irresistible urge to take advantage, especially when the chips are down, but before he is even fully aware of his predicament, the choices he makes upon his arrival begin to seal his destiny and shape the people he meets. It’s an epic journey full of great humor and powerful imagery that marks a monumental technical and artistic achievement. Danny Elfman’s score is so perfectly in tune with the production and a must have, especially for fans of his work on Big Fish and Charlie and the Chocolate Factory. Peter Deming, Director of Photography, gets to play with every trick in his trunk and creates a seamless and believable atmosphere where fantasy knows no bounds. The rest of the cast is terrific, but my favorite supporting performances come from Oz’s primary companions, played by Joey King and Zach Braff. These characters lit up the screen and really played a part in Oz’s transformation as opposed to simply adding comic relief. 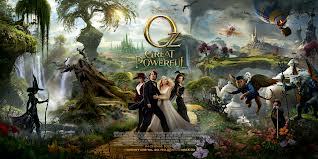 Oz the great and Powerful in Real 3D will envelope you in a world unlike any other, so real and so imaginary it is a sensation that is unique to cinema alone and yet only the highest of aims and the loftiest of dreams can harness it. It provides sufficient enjoyment of these gifts yet never treads away from the story. So you can ease on down the road with little urgency, but no less compulsion to move forward. This is a great piece of art that introduces one of the greatest characters in cinema history to one of cinema’s oldest and most timeless worlds.